Because I've got my eyes straight up, all up on that prize, I just revamped my laundry flow. You're on the edge of your seat, I'm sure. I realize this gives me more laundry days overall but the amounts are much more manageable (maybe only a load a day compared to the 3 or more that I had been doing). 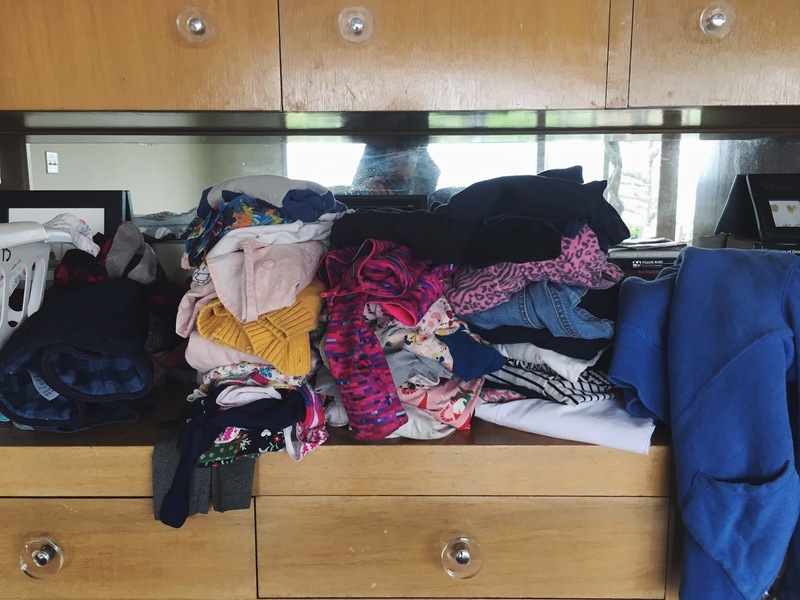 I also was needing to come to grips with the fact that I needed a laundry day over the weekend and, as much as I hate laundrying on weekends in general, our grown-up clothes are so much more appealing to wash on a Saturday than my kid's. No offense, kids. On the days that we are home, or if afternoons are chill, I am having the girls manage their wash. They can pop it in before school in the morning, I can switch it out midday, then they fold and put away in the afternoon. Not only is this THE BOMB, but I'm hoping to God it inspires them to wear only 1 measly outfit a day and stop stuffing clean things into the hamper when they "clean up." So help me, baby J. Anyway, is this post a SNOOZE or is it a snooze?? It's so big I could probably stuff 4 children inside of it. Don't worry, I won't. ANYWAY THAT'S THE STORY OF MY LAUNDRY. I'll keep you posted bc I'm sure you can't wait. Girl, can't wait to see that washer. They are just the right size. not too big for kids to carry, not too small. rectangular so they don't waste space. Love them. Smart! I love this system. Definitely need a better system. Yours seems doable.. I do all of it in two days. Wash all on Monday. Fold/put away / cry. Etc on Tuesdays. It's getting to be too much but as of now I don't sort light and dark. So bad. Don't tell my mom..
No, but really. I've been researching because Kevin does all the washing/drying/folding of the laundry in this house (praise hands) and I think he deserves the equivalent of power tools to do it. We've had the same washer for a dozen years and had to replace the dryer 3x in the last year (used, obviously) and this 4th one needs replacing too. Wahhhh. Anyway, what did you buy?!?! Also, SYSTEMS. Systems are amazing. I really like the ideas you have and the comment above about the baskets. Love. I just do laundry for myself BUT I have a gross, dirty job and an oldish washer ...Persil gets out any stain and smells so good! BEST detergent I've ever used! We had our own laundry baskets growing up, and it sorta turned out laundry room into a closet. Just a fair warning. Mom probably could have just gotten rid of all the other clothes in our closets, lolz. Currently I don't have a laundry room so sadly I cannot employ systems and tables! Good luck!!! Really nice stuff Blythe, I know how difficult this is. It took me 24 hours to confirm the spell power of HIGH PRIEST TOKUBO SPELL TEMPLE which brought back my ex lover to me till today. I never believed spell casting could bring my ex back after been fooled by other spell casters not until i went on a research on-line about spell-ism and i got a testimony from a lady who high priest tokubo help to get her husband back and another guy who got his ex back by High preist tokubo, no matter what happen between you and your ex that lead to break, he will bring your ex back to you and he also prepare spiritual charms to help get divorce lovers back and to help make more profit in business. His E-mail address: (highpriesttokubo@gmail.com)Am really full of happiness, may God continue to Bless this man for his hardwork and sincerity Please, once your ex is back, also share the good news to other people. Together we must fight to stay happy. hi everyone, my name is Mungur, i really want to tell you guys about someone who help me so much. He is an angel sent from God, he might be god. Guys, i have found a spellcaster who is just amazing. he is genuine and he is the best spellcaster that i have seen in my life. a real spellcaster, becasue i have found one, his email is jayemamagictemple@gmail.com... i was was so lost and i wanted to commit suicide but then i found him, my saviour.